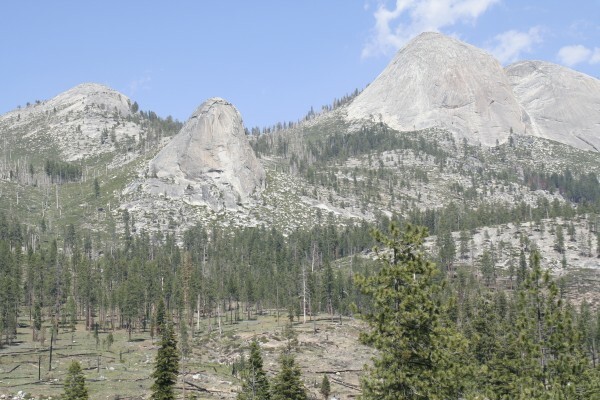 One of the best climbs in the Sierra that sees relatively few ascents each year is right there in plain sight, visible from the Glacier Point road. Some consider it a Sierra classic. Others have just heard rumors about it. 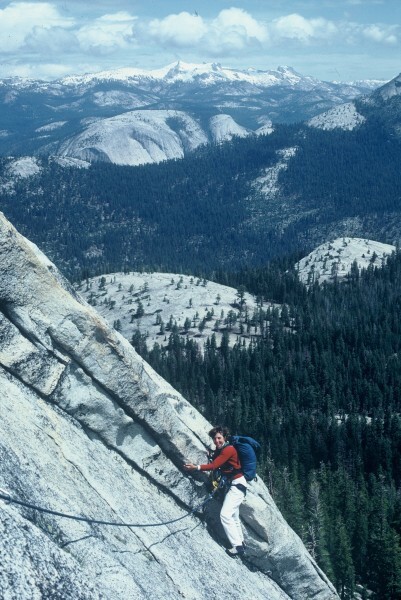 Did you ever want to take that day off from climbing with the crowds in Yosemite or the Meadows? Or maybe you've done the classics many times and just want an enjoyable outing on some decent rock in a remote place. Or you've been looking for a new moderate multi-pitch trad climb. 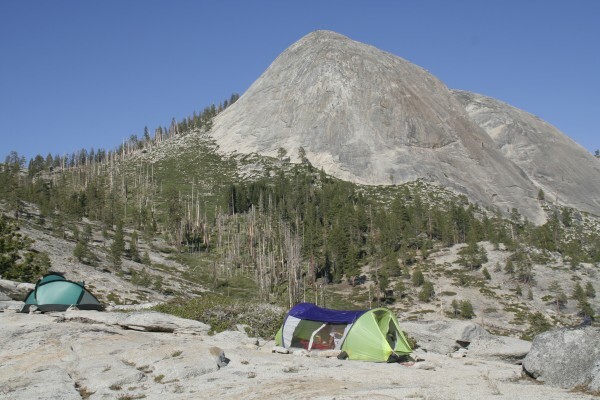 How about a dome climb with awesome views of the South Face of Half Dome and an overnight bivouac on a ridge with a view of the top of Yosemite Falls? To properly introduce at least my climbing trips to Starr King, I have to start with Snake Dike. From 1975 to 1981 Snake Dike became the annual Memorial Day trip. We'd hike up the Mist Trail; stop at the top of Vernal falls, hop over the railing, and crawl down through the narrow tunnel that leads out to the edge of the falls; hike past the lake at the base of Half Dome, filling up with water on the way; and hump it up to our dry camp on the north side of Mt. Broderick. 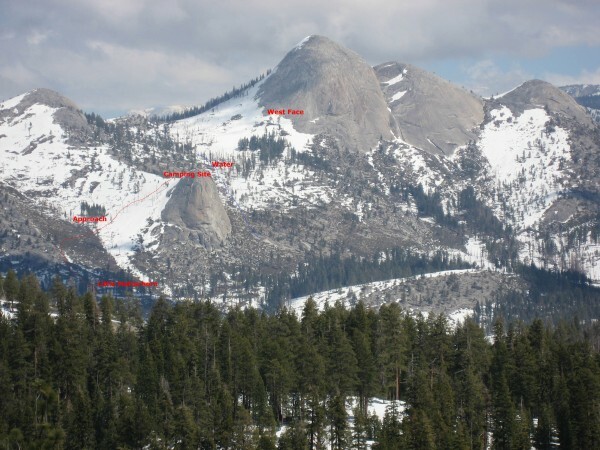 There's a huge terrace with stunning views of Little Yosemite and the South Face of Half Dome. Hauling a day and a half's worth of water up the last few hundred yards to the terrace was brutal. The next day we'd climb Snake Dike and a few times we spent the night camping on top of Half Dome when it was still legal. In 1975 the cables still weren't up on Memorial Day. It was fun going down that time; certainly no drama. 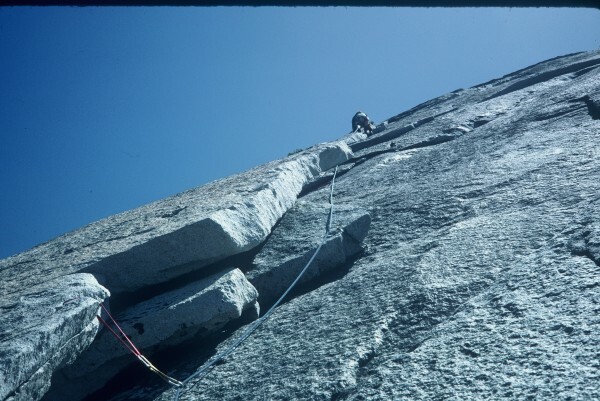 In the early 80's the climb started to get a little too crowded, and some numbskull painted, yes painted, some graffiti on the granite slab near the bivouac area. This really put a damper on our enthusiasm for a formerly pristine favorite camping spot. We'd been looking over at Starr King from Snake Dike for all those years, so we thought, hey, let's check it out next year. Also, we wanted to try something new. There was always too much snow on Starr King on Memorial Day, so it became the annual 4th of July Trip. Roper's Climber's Guide to Yosemite Valley listed a few climbs on Starr King that sounded interesting. 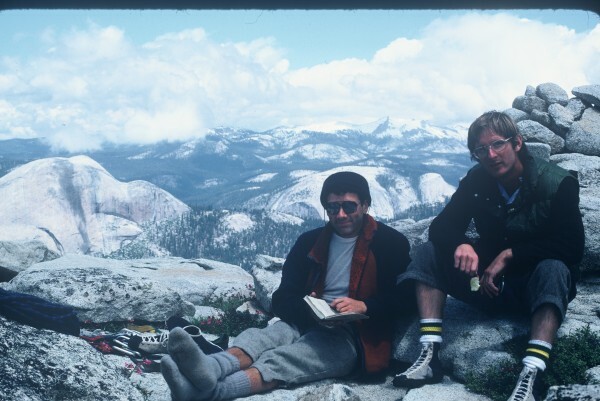 So Jan, Wayne, and I took off from the Valley with camping and climbing gear over the Fourth of July weekend in 1982. A grueling approach up the Mist Trail (with the obligatory stop in the tunnel) and out towards Mt. Clark brought us to a point on the trail below a dome which is at the bottom end of a narrow ridge below Starr King. Here's a picture of the dome (the closest one to the camera), with the more rounded dome behind it on the upper part of the same ridge, and then Starr King. From the trail you walk through an open meadow shaded by some large pine trees. Then it's into intermittent brush and sandy soil. We were able to wind our way through open terrain for a while, past a free-standing landmark granite rock that we dubbed "Little Matterhorn". From the LM you bear slightly left to the slabs at the left side of the drainage, follow along on the slab edge for a while, then put together kind of a trail (bushwacking required) across the drainage and up the other side to the top of the ridge. The approach, campsite, and Starr King, taken during a March ski tour to Glacier Point a few years ago. With a full pack, it can take about an hour from the trail. You end up on an incredible ridge with an awesome view of Starr King. This is the good news. There are two good tent sites. The one closer to the dome by the tree is better since it has at least some sand underneath it. Other than that, it's pretty hard to find anywhere flat on sand. There are plenty of places to roll out a bag on exposed granite. The campsite and Starr King. But there is no water, and there can be some or many bugs, depending upon the time of year and that year's snow conditions. Most of the times we noticed some bugs. A couple of times it was more pleasant to get away from the bugs after dinner by going to the top of the dome by the campsite. The views from there are sublime. The top of the dome can be seen in the following picture taken of the campsite from near the top of Starr King. 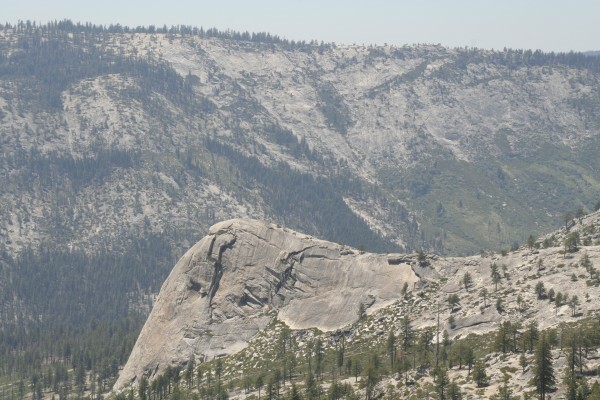 If you imagine that the ridge and dome are the head of an animal (note the depression for a left eye and the main face being a forehead and nose), the campsite is at the big tree (on the back of the neck) closest to the top of the dome. Although the camp is dry, not to worry. You can go up the ridge a little bit and then traverse into the drainage to get water from an intermittent stream that has been running all eight 4th of July's that I've been there. Depending on snow, the stream could be running well into August. There's usually enough water to take some kind of a dip. We came back one year to find someone had thoughtlessly had a fire on the ridge and didn't get rid of the fire ring and blackened some of the rocks. Not cool. Please, if you camp here, don't leave a trace. The first year (1982) we ended up doing a reconnaissance and climbed one of the east side routes. Can't remember whether it was the official 5.9 listed in Roper's guide. But the views were outstanding and the climbing was clean and fun. Janet Tornow on the east face of Starr King with the top of Mt. Watkins and parts of Tuolumne in the background. 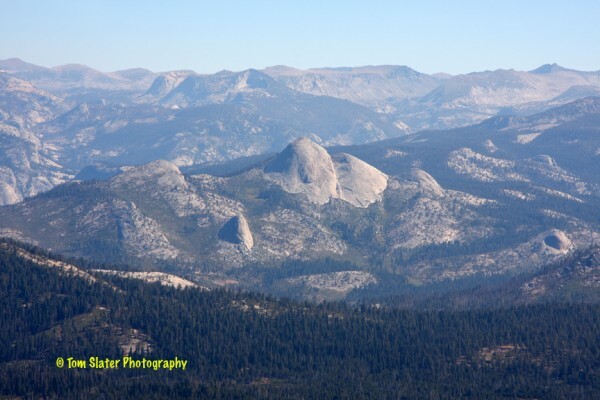 The views from the top are a stunning panorama from Yosemite Falls to Tuolumne to Mt Clark, the Clark Range, and Red Peak in southern Yosemite. Picture of Wayne Campbell and me taken by Jan on the summit. Note the advanced footwear (EBs). Getting off of Starr King is no drama. 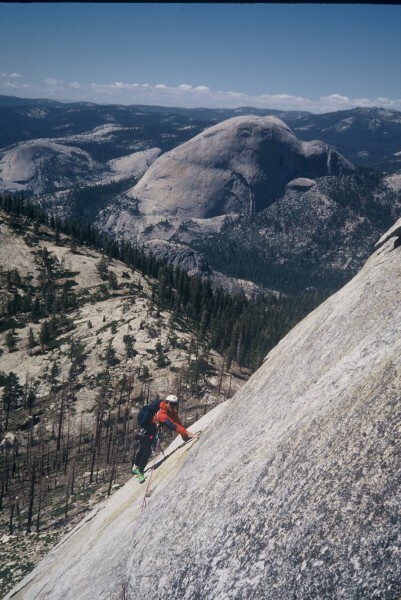 You walk down a ways towards the saddle between Starr King and the dome next to it, and then belay a fourth-class down-climb for one pitch to a huge block on a huge ledge. There was usually some very manky old rope around the rock that you could attach rappel ropes to. If you want to replace the old rope, bring bolts or at least a good 20 foot section of rope to replace the old one. You may need more than this. Can't really remember. 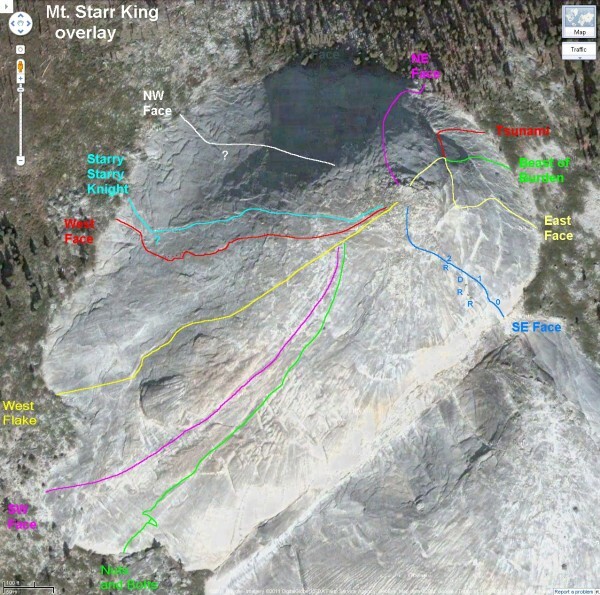 The first pitch on the regular route of Starr King from the saddle is mainly 5.4 friction. With two 50m ropes you can rap almost the whole thing. You can also down-climb this pitch pretty easily. 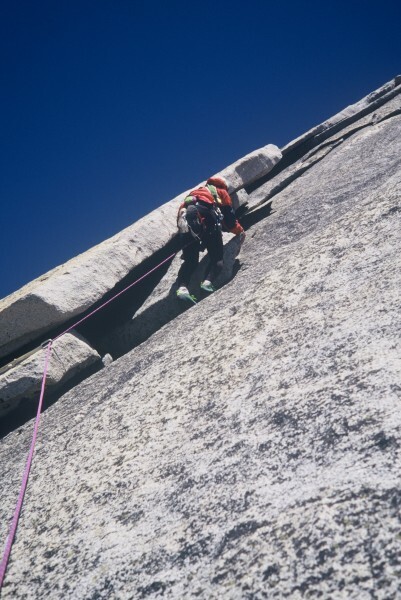 Even if you only have one rope, the last one down can have a top-rope for half the pitch until he/she gets to easy enough, not very exposed down-climbing where you really don't need a rope. We came back in 1983 with more friends and repeated the east side route. Then we focused on the West Face route. After an early start and bushwacking, we made it to the base of Starr King. The route starts to the left of the largest trees on the face. The first pitch goes up past a bolt with a bit of (not-too) runout 5.7 - 5.8 face climbing to a shallow corner. Several guides say that the bolt is a "belay bolt". It wouldn't be safe belaying off of one bolt. Also, at that point, you have plenty of rope left to make it across the face climbing. Wayne Campbell following the first pitch. The next pitch and a half wanders up some small dihedrals. The last half of the third pitch wanders up left across some face climbing to a good ledge with a bomber anchor. The ledge is around 20 feet below the right edge of the undercling pitch. We noticed a bolt out to the left of the belay and decided to do a face climbing variation to this pitch which leads to the other side of the undercling pitch. The anchor for the fourth pitch is just above the roof. Bob took manned flight for about 15 feet after greasing off the crux move of the 5.9 variation in his EB's. He surged back up the regular route and made it. This pitch is like a reverse-direction 5.8 version of the second (5.10a traverse) pitch on the Sting in Tuolumne. There's a really nice belay ledge just over the roof (at the far side of the undercling) at the base of the dihedrals. Bob Care leading the undercling pitch. The fifth pitch is some very enjoyable 5.5 - 5.8? dihedral climbing. Here's a couple of shots of climbing the Upper Dihedrals. Vic Madrid leading the Upper Dihedrals. Wayne Campbell leading the Upper Dihedrals. The last climbing pitch (could be your sixth) involves traversing up and right until you can walk the rest of the way. At least, that's the way we've always done it. This section is a bit runout on C2 or C3? pro at 5.7R - 5.8R. If the view from here doesn't pique your interest to climb this route, probably nothing will. Vic Madrid on the last roped pitch. Half Dome in the background. A couple of notes: Someone needs to replace the two bolts on this route because they looked old in the 80's. Your number of pitches may vary. We tended to do the route in 6 pitches. It's not clear that this route as described here is the same as the West Face route that is described in the guide books. Certainly the first few pitches are the same, but it's a little hard to tell whether the upper half which includes the undercling pitch is the same. Doing the face climbing past the upper bolt to bypass the undercling is definitely a variation. In 1984 we couldn't get a permit to hike in from the Valley and had to start at Mono Meadows. Not surprisingly, this turned out to be a much easier way to get there, and we used it on every subsequent trip. You go down to the creek, cross it, hike to the trail junction, hike on the trail to Panorama Point for a ways , then cross-country to the other trail that leads from Panorama Point to the Clark Range. If you take off from the trail in the right place, you should end up pretty close to the base of the dome and on the trail that leads to the Clark Range. How to get from here to the campsite was described earlier. In 1996, the year after the fire, we decided to traverse around the other side (the Clark side) of the dome. It wasn't any easier than the regular way (up the drainage to the north and west of the dome). And this was just after a fire had taken out most of the big brush. It's probably all grown back by now. This time we were intent on making it up the West Face the hard way, and we had a new weapon: sticky shoes (Fires'). So instead of going over the arm bar undercling, we went right up the face climbing. It's a really fun way to do the pitch if you like Tuolumne-style face climbing. Looking down, we could see that this bolt was part of another direct route. 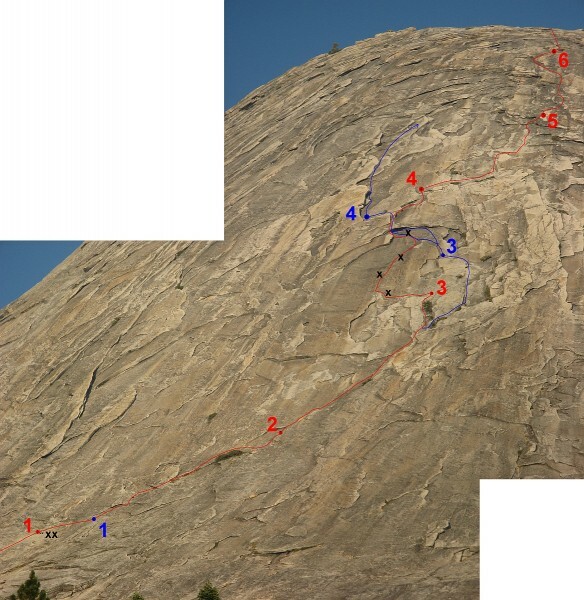 See other comments in this thread describing this West Face route. Wayne Campbell following the crux 5.9 (one move) face-climbing pitch. 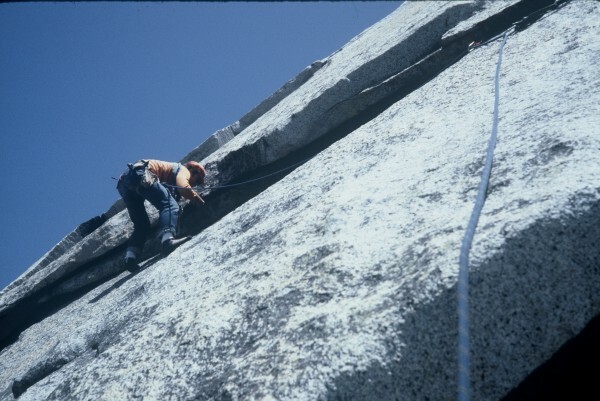 The harder face climbing can be avoided by doing the 5.8 undercling. 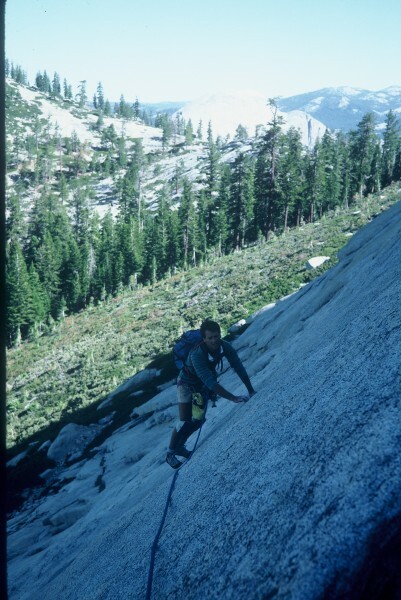 In 1986 we came back again on 4th of July weekend, and put up what we thought was a new route on the south flank of Starr King. It starts just left of a major roof. One bolt was placed. It was kind runout, but pretty easy lower fifth class climbing. We also did the West Face. The last two trips up the West Face were memorable for different reasons. In 1996 Vic and I did a car-to-car trip, with me at the tender age of 47. I know it doesn't sound like a big deal for that age, but I'm not in the best cardio shape in the world since my knees and hips are trashed and I can't run. We left around 6AM and made it back by moonlight at 9PM. It's a long way. Also, the views are so great that you just want to hang out, even though it's a long way back to the car. Note that when you are tired later in the day, it's easy to get a little disoriented going cross country between the trails on the way back. In 1998 I convinced Dave to do the West Face. I kidded him a lot about the huge creek we had to cross on the way in. Out of the five previous trips at the same time of year, there was only once when it would have been life-threatening to wade the creek. Fortunately, that year there was a bridge of logs across the creek. The other times, we waded the creek up to mid-thigh, at the highest. So as we are approaching the creek this time, we can hear it from a ways away. Not good. We get there and the damn thing looks like it's 100 yards wide. Dave makes a comment like, "you didn't tell me that the creek was Illouette Creek!" Based on past experience, I didn't think it was going to be any drama. Not! There were several sections of a very wide creek that were over our heads. We were looking at a long detour to go over the bridge at Illouette Falls. We searched up river and found a monster tree that had fallen over almost the entire width of the creek. So up we go. As we get closer to the top of the tree, things become more precarious. The tree is swaying, and the branches that we're balancing with are moving side to side. And the tree doesn't make it all the way across. Only one thing to do: jump. Wet feet, but not too bad. It was especially entertaining climbing back onto the tree on the way back with packs on while standing in thigh-deep water, trying to balance on the swaying top of the tree. Anyway, it was well worth it for the usual incredible views and climb. There are undoubtedly some other beautiful route possibilities on the West Face, including the bolted route that we never climbed. See the Comments section below for info on more routes. qigongclimber is a climber from the Bay Area. I want to go up there some day. Looks cool. I have often looked at Starr King's routes in my old Secor guide, and have been back there scampering around checking out some of the domes further towards Clark, but man, this one is one my summer hitlist for sure now! Thanks! Looks like fun ! Only done the SE Saddle route on Starr King, on a dayhike from the Valley in May 2005. I recall it being 5.5-ish (old school rating would be fourth class). Always wondered how it was up there, and now I just gotta go. Wonderful rock on Starr King. Great historical insight. Way to get back to the lonelier corners of the Park. Thanks for sharing. Great photos! Awesome TR Tom. Love that photo of you & Wayne. 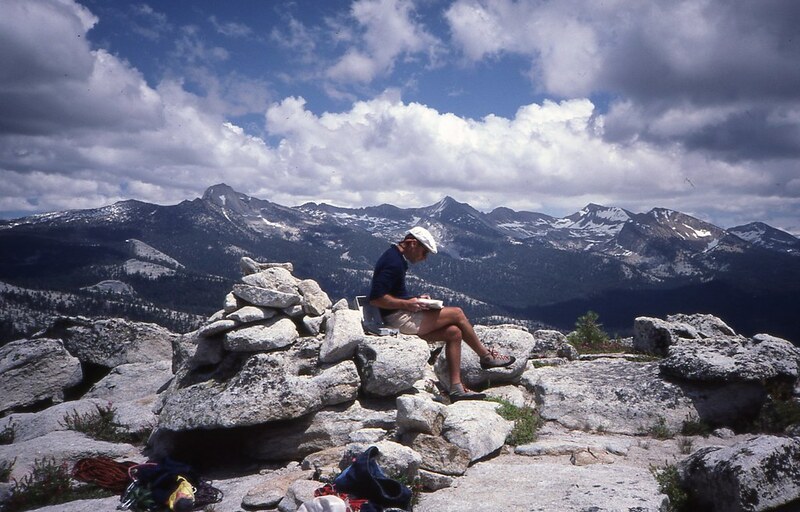 Here's a photo of Wayne on the summit probably mid-1980s. Great trip report. I've somehow missed Starr King among all the Sierra routes I've done. You've inspired me to make it happen this summer. Very nice. [Edit:] Thanks for fixing the typo. Ken Boche posts here as BooDawg; he probably has some stories to share. Clint: thanks for pointing out the typo (it's called senescense) and for listing the other routes from the S. Yosemite guide! Great and inspirational TR - thank you. We did maybe a total of 75 pitches back in that drainage, although it's probably over 14 years since I've been back there. Sounds like you've got some TR writing of your own to do! Let's hear some tales! Reads, and looks, like a great series of adventures. Thanks! Awesome TR. Thanks for sharing. Those pictures are really inspiring. First I saw the name Wayne Campbell and had a flashback but couldn't remember why. The I saw a name that doesn't show up on ST often at all... Bob Care! I did plenty of climbing with that old fireman! We had a great epic on the North Face of Quarter Dome during a rainy multi-day ascent. Great guy! And Starr King is a great Mountain. I named one of my sons after it. this is a great trip report/guide/history lesson. I love to hop the rail and sit under the waterfall up a Vernal. Yours is the first mention of that I have seen since reading about it in John Muir's My First Summer in the Sierra. A huge gap in my Yosemite tramplings is Mt Starr King, so this TR helps fill this gap. Thank you. I learned first hand that the USGS map in the area is inaccurate, making for some interesting adventures. Impossible to "get lost," but confounding when drainages abruptly end in a place no one has ever seemed to have ever been. With Starr King prominently featured in views revered by many, this destination is certainly a five-star classic. Thanks for the report. Seen it so many times skiing up to Glacier Pt, but never made it out that way. Looks like a nice route off the beaten path. ideal munge climb... easy peasy, cept for those pesky skeets this year. Panorama of 2 photos stitched in PhotoShop taken from the summit in the early 1980s. I have that whole register of which the previous photo was taken on microfilm and have made a book out of it, unpublished since I have no resources. Some of it is actually pretty interesting since I researched the backgrounds of a number of names in the first two registers and included information about them. I also made tables and graphs which include summarizations of the various climbers and their climbs (all 1364 of them). One comment I might make is that the only death associated with the dome as far as information derived from the first two registers revealed was a drowning in Illilouette Creek. 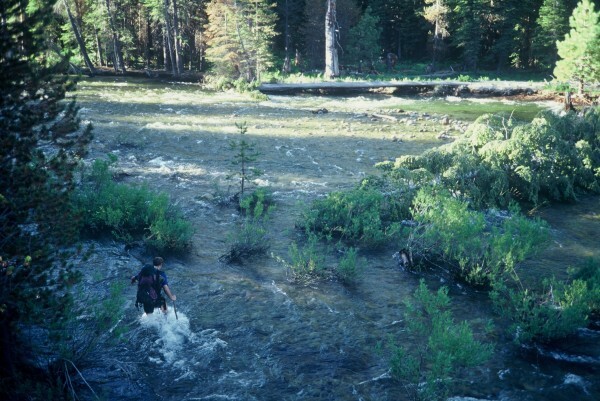 Be aware that the creek is a definite hazard until the snowmelt has wound down. Bill: you made a microfilm copy of the summit register when it was changed out for a new one? Over what time period do the 1364 entries span? BBA, When i climbed Star king in 79/80 Salathe's name was in the register. Is his name on your microfilm? It would be a cool book to look at.. The registers I have on microfilm are the first two placed on Mt. Starr King and span 1931-1981, and a few in 1982. The first was 1931-1936. The second was 1937-1981+. "PAGES MISSING. The climbing year of 1949-1950. Entries from September 4, 1949 to July 22, 1950 are missing. An entry in this register on July 25, 1965 refers to an entry by Anton (Ax) Nelson dated October 23, 1949. Nelson’s fame on the Lost Arrow was too much for a souvenir hunter to ignore." I know there is a climber out there with the torn out pages, and I wish he or she would somehow get a copy of them to me so I can add them to the record. Such is the life of the pseudo historian such as I. The pages in 1954 are also missing. However, if anyone else has information about the Salathé climb of the peak, let me know and I can put it in the book. Something like that photo of the page with 1938 would be good. And if anyone would like a copy of the register book I have made, let me know by e-mail and for $5 (covers my costs) I'll send a DVD with the book and the scanned images of the microfilm. You'll like it. In reference to Jack G. Kirk-I believe he was a long time trail crew worker in Yosemite. 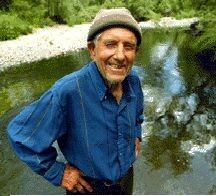 I met him at a TCW campsite in Little Yosemite in 1966 ish on a body carryout from below the NW Face of Half Dome. He was an old fart back then and had been around a long, long time. Jack was notorious for his speed on the trails and I believe, had won the Dipsea Race over Mt Tamalpais a number of times. Little research can varify this. 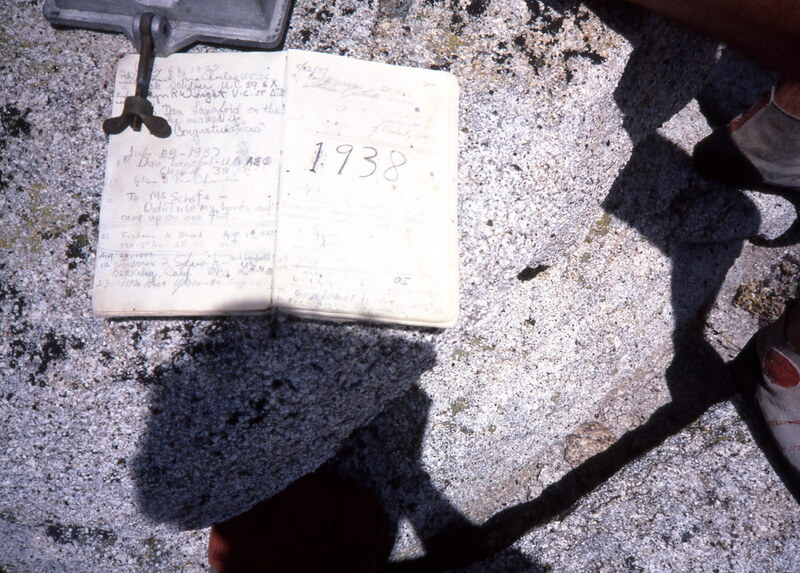 "Jack Kirk’s entry is primary evidence that pages were torn out for the 1949-1950 climbing season, and one of the climbers whose entry is missing was Anton (Ax) Nelson (see the page beginning June 28, 1948). No mention of Salathé is made, so where his entry might have been is still a question. Jack Kirk also has two other comments of interest, “waited 35 years for this” and “Dipsea Deamon”. The thirty five year wait probably refers to the first change in handicapping the Dipsea Race which goes from Mill Valley over the mountain to Stinson Beach. The race organizers finally changed the handicapping from a somewhat arbitrary basis to a clear cut age related basis. Jack Kirk first ran the race in 1930, so this entry is 35 years later, just when the change was made. He won in 1967, so it worked for him! Since he is connecting this to Anton Nelson, there may have been a competition. Unfortunately, we are missing Nelson’s entry. Kirk was known as the Dipsea Demon for his outstanding performances and the longevity of his entries. Kirk ran in 67 consecutive races from 1930 to 2002. There were a couple of years when the race was not run in the Depression and three in World War II. Kirk’s last run was at age 95. A movie was made of him and the race, The Dipsea Demon." So one may imagine I have put in just a little work on this. Impressive!-So that was the same Jack and when I met him he was close to 60. I do remember he wore black and white tennis shoes and he was quite the celebrity among the crew if at times a little odd? Why don't you self-publish the book. Quite inexpensive on the internet and the results are amazing. With modern technology it does not matter if you do 10 or a hundred. In reality you need a good graphic artist and designer. We did one and were quite happy with the results. Couple shots of old Jack Kirk from the Dipsea site. Ho man does this thread rip it all open? I've only one recorded ascent ((or should I check with BBA?) but our NE 5.3 scramble was notable for our planned summit bivy. A beauty it was! Someone else must've prepared that sandy spot just to the west of the summit--a perfect double bed! Margaritas at twilight. I love that area for it's peace, remoteness and beauty. Mt Clark is stunning too! The Illillouette creek camping is fine too and I had a rough spring creek crossing on one pack trip with my father and brother-Dad went down in the current and caused a ruckus--he was 65! Walleye, I love that picture, can we talk? Also great pix and the info about the registers. Always wanted to do it! So cool, thanks! Stokes the fire! so what's the smaller dome called? What is that mysterious dome (not Half Dome) photographed by Klaus? As AlDude and the Warbler note, it's slightly west of Starr King. In addition to the routes they mention, I know of at least 4 other lines on it, ranging from 5.9 to 12d. They were established from 1984 through perhaps the mid '90's. At one point, I thought Galen Rowell had climbed on it as well, but in an Indian Rock conversation much later, he told me he hadn't climbed on any of the similar domes in the Illouette Creek drainage. We called that dome Dome Baez in 1984, when we established Diamonds and Rust (left side of dome as pictured; 10c chickenheads) and some 5.9 all gear line reminiscent of The Surprise on the right side. I can't remember at that point if the AlDude/Warbler lines had been done, although I remember seeing signs of their passage in later years, when we established a short 11d route and a 12d line not as far to the left. Inner City - I only see two Dave R's in the registers (different last names, but begin with R) with one ascent, one ascending in 1965 and the other in 1975. The third Dave R was a famous climber who had two ascents. Since you're here, I'd guess it was the 1975 ascent. I only Have the 1931-1981 registers. "Made it to the summit in 2 hrs from Happy Isles" - NED GILLETTE.. and then somebody else wrote around his entry, "BULLSH#T"
I would believe that Ned Gillette could cover the 7 mile, 5000 ft elevation gain from Happy Isle to the summit of Mt. Starr King in two hours. He was a cardiovascular machine. Hiked in Monday, set up camp on a bench below the south and center domes, then soloed the Southeast Face (wondering what shoes they wore for that in 1867?!). Then did the West Face the next day (yesterday, September 28th). Both routes were excellent. The views were fabulous. And the temperatures were surreal - late September and we barely needed a sleeping bag. Uh-oh, you been flying Slater? wondering what shoes they wore for that in 1867?! 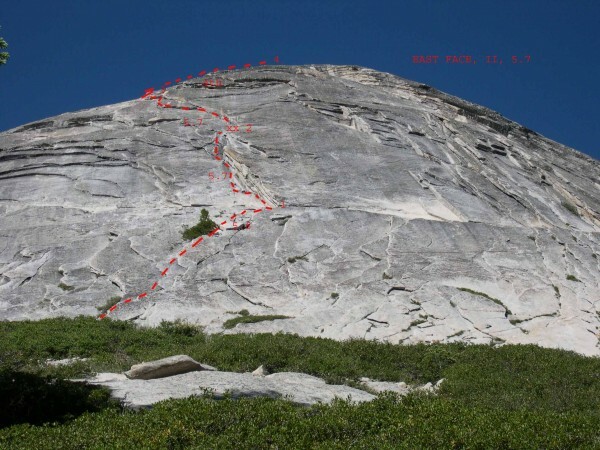 Anderson supposedly used bolts driven into drilled holes as he did on Half Dome. Bump for the real deal! The climbing on this route is merely good but given its location, the views and the formation’s beautiful isolation, this is a two-out-of-three star climb. Pitch lengths are approximate and variable (since no pitches except the first have fixed belays). The “R” rating is warranted since the protection is often under somewhat thin flakes and takes better than average skills to arrange safely. Pitch 7: (5.0) Eighty more feet of easy flakes and face leads to the end of the climbing. Two hundred fifty feet more of class 3 and class 2 lead to the summit. In our ascent, we found the “start” tree, although we thought “forked” was a better descriptor than “bent.” Regardless, it is hard to mistake the start of the climb. The first pitch is also hard to miss: it is the obvious line of least resistance up and slightly right. I wouldn’t use the word “trough” as Secor did, and certainly wouldn’t use “water trough,” as Spencer did, but semantics aside the first pitch is obvious. The second pitch is also easy to find. Above this point, though, all descriptions become quite vague. We ended up searching out the “line of least resistance,” and taking that. The bolts we found on this route reinforced our belief that we were on the original climb. We found six bolts; two at the end of the first pitch (the belay) and four on the fourth pitch. Of these six bolts, five were identical (that is, identical bolts and hangers). Specifically, all bolts on pitch four and the right bolt of two at the end of the first pitch, were ¼ inch, “screw-head” bolts with Leeper hangers. The left bolt of two at the end of the first pitch was a ¼ inch “button-head” bolt with an SMC hanger. I suspect the “button-head” bolt at the belay is newer since the bolt style and, especially, the hanger-type is newer, and this bolt was much less rusty than the other five bolts. Also, at least one other, earlier party has reported only one bolt, not two, in (apparently) this location. I think this second bolt was added to the belay on a subsequent ascent. Given the bolt and hanger types and the degree of rust on the other five bolts, I suspect that they are from the original ascent. On our ascent of this route, we took a photo-topo made by “gigongclimber” as part of a trip report he made on Supertopo Forum. We found with one exception that the “line of least resistance” and thus the most likely route followed by the first ascensionists, was the one “gigong climber” described. The exception was how we climbed the fourth pitch; where “gigong climber’s” trip report describes (and shows) a leftward undercling we moved left sooner and then followed bolts up a face to exactly the same point they reached. 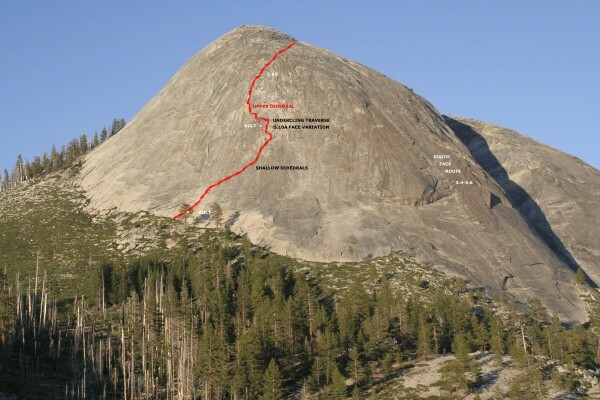 I think it likely that with this one exception, the route “gigongclimber” climbed is the original route. I’d love to hear from Ken Boche on this subject if he does post here. This route was rated 5.8 when it was put up in May 1970. We found some 5.8 on pitches two and five. We also found that the route crux was on pitch four. This bolt-protected pitch involved consistently 5.8 slab moves up to a point just before and just after the fourth bolt. The sections before and after the fourth bolt are the crux of the route. These moves would probably have been rated 5.9 if they had been put up after 1990. 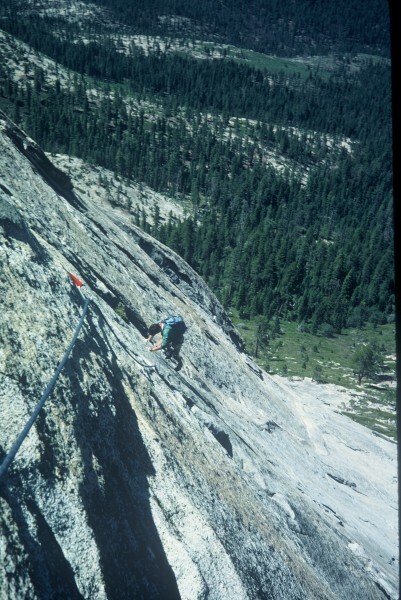 Given route rating styles in 1970, modern “almost-5.9” climbing would likely have received a plain “5.8” when the route went up. Prior route descriptions require a traverse “to the right” somewhere in the middle of the climb. Secor, for example, describes traversing to the right for a distance of 30 feet. But we couldn’t see anywhere obvious to traverse right. In fact, it looked artificial and difficult to traverse to the right. If instead one assumes that some typo or error was made in a past description and that a left traverse is required, not a right traverse, everything falls into place, including where other parties have climbed, the locations of old bolts, and even photos of the route’s location in books. A final note as to the Secor guide’s description of routes on Starr King: if “gigong climber’s” photo-topo and description of The West Face route is accurate, and if what my partner and I climbed was indeed The West Face route, then the labeling on the photograph of Mount Starr King on page 412 has the routes Nuts and Bolts and West Face transposed with each other. 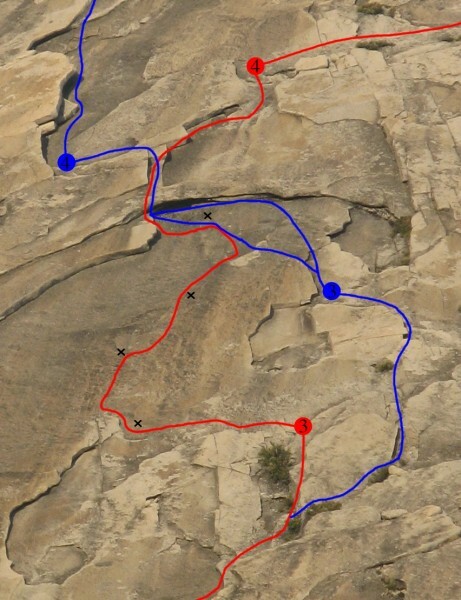 That is, The West Face route should be what is labeled “Nuts and Bolts” and vice versa. Nuts and Bolts description says it: “. 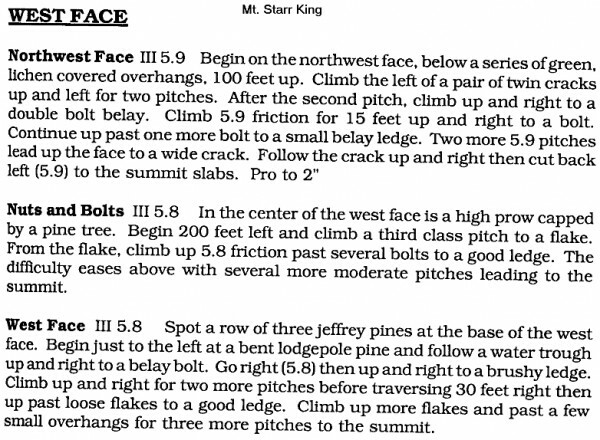 . . starts 200 feet to the left of a high prow with a pine tree on The West Face of Mount Starr King”. This prow with a pine tree is easy to see. If it truly is above Nuts and Bolts, then Nuts and Bolts must be to the right of The West Face route. (Also, if this conclusion is correct, Nuts and Bolts should also be placed after The West Face route in order in the Secor text). mtnyoung: thanks for posting! Sometimes it's clear that I don't pick the easiest route up something or that I am particularly adept at following a route as described in a guidebook. 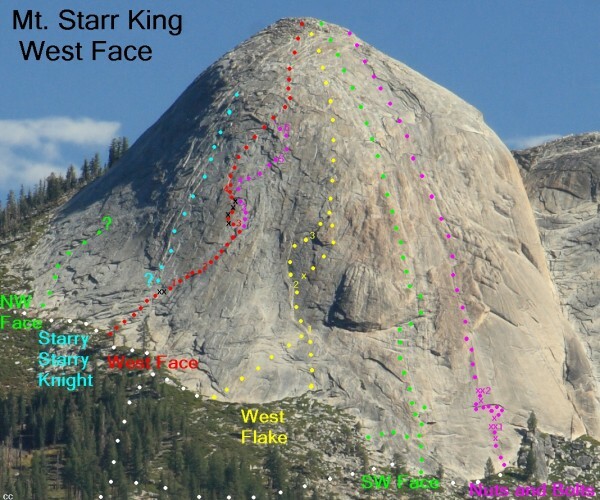 The West Face of Starr King is no exception. Based on your great description of the route you did, it's pretty clear to me that your first four pitches are not the ones that we always did. For instance, our first belay never ended at two bolts. You don't describe face climbing 5.7 past a bolt on the first pitch. In the picture in my trip report where Wayne is traversing up to the belay at pitch 1, he's pretty close to where he unclipped the bolt, and I am definitely not at an anchor with bolts. Our route and yours come together on the 4th bolt of your 4th pitch. That bolt is the higher one that I show on my topo. As you describe, from the fourth bolt on the fourth pitch you go up and slightly left over a roof to a really good belay. In my trip report, the picture taken looking down to Wayne who is coming up the crux face climbing is taken from that belay. The two pictures looking up the dihedral are also taken from that belay. I would call the face climbing at the fourth bolt 5.9. For a lot of people, it's probably hard to tell the difference when the climbing is so easy (less than 5.10). If I were to call that 5.8, I'd use the Teton rating system and call it F8 (i.e. f**king hard 5.8). I still have no idea where the true West Face route is. Maybe Ken Boche can clear this up. I'd guess that you guys in fact did the real West Face and we just did a fun and easier variation. You basically go straight up, and our route does an arc out right and comes back. Thanks for clearing up the mystery of those other bolts that we used to look down on from the fourth bolt. My topo could be way off on where the start of our climb is. All I know is that we diagonal up and right from the ground past a bolt to a non-bolt anchor on the first pitch. Regardless of which route anyone chooses, I totally agree with you that the climbing may not be the absolute best in the world, but the ambience way more than makes up for any shortcomings. What time of year did you do the route, how deep was Illouette Creek, how good are the bolts, was the water still running in the creek below SK, and did you do it as a day climb (how long did it take car to car)? Edit: Reading mtnyoung's comments on Difficulty, I think he is right, judging from our attitude BITD that the limit was 5.9 (even tho 5.10's were common by then). Also, An Assumption: He's right again, Nuts & Bolts is to the right of the West Face, but to the left of that obvious prow. No need to get too much information, people! That only diminishes the ADVENTURE! Get out there and have some FUN! We went this year, during the last week of September. Illouette was easy and the creek below Starr King had just a faint trickle, and that only in a few locations. My partner came up from Santa Rosa, so we did the hike in on the afternoon when we got there. I then soloed the regular route and we bivied. The next day we did the West Face and hiked out. We were amazed to have the whole basin (seemingly) to ourselves. And it was so warm we barely needed our sleeping bags (the weather broke a week later). And those bolts on the fourth pitch? Very rusty 1/4" bolts with very rusty Leeper hangers. They certainly could be from 1970. Are you going back next summer? (I'd like to do a few of the other routes there and plan on going back at least every few years). Brad, Starr King is definitely not the best of the domes in the drainage. It's big, but rock quality (especially on the west face) is less than stellar. hit me up for info sometime and I'll fill you in on other choices out there. There's a lot of fun stuff to do, and it's even more empty than the 108. I couldn't tell you where the route we did on the west face went, but it was clearly a different line from the old Boche route and the other route described. I probably even have some slides buried from some of those trips, but more from other stuff in the vicinity. Here are some rough guesses on where the different Mt. Starr King routes go. There are probably some wildly wrong lines here, but it's a start. If anyone has some corrections for the lines, please make them or describe them. I hope to get up there myself this summer and check out the climbs. It now includes a four page write up (page 123-126) that Joe Fitschen sent to me recently. Penelope May and I just came back from climbing the East Face of Starr King. The 5.7 pitches are a bit sustained but the pro is decent, mostly small and medium wires and cams. The rock is good. My friend Ian just did the West Face this past weekend, and made these nice overlays. They show a lot more detail of the rock, the flakes, etc. Pretty cool. He and his partner used Brad's description and Tom's photo to find the route. He also reports lots of manzanita, water hard to find above the stream, and not too many rap slings. Nice pics Clint. That middle section of west face looks really fun. Has anything been done on the south face proper? It's a unique setting, with that granite trough all along the base. These are all the routes that I know of at present, so I haven't heard of stuff on the South or Lower SE Face. (Other than the route I renamed to be SW Face). Some people do climb the 3rd/4th class gully between the main summit and middle summit to approach the regular SE Face route. It's a bit hard to tell how steep it would be to climb out of that gully onto the Lower SE Face. Although after a few pitches it would be low angle. Great info Clint. Looks like countless variations could be done on the flakes riddling the W. face. Hey Clint, nice new pics! A couple of comments: The two bolts shown as the anchor for red pitch 1 looks like where the single bolt used to be (the one that i refer to in the original TR). If someone added another, great. We used to clip a single bolt where the two are shown and belayed at blue 1. Blue 4 was always our fourth belay. It's a very nice big ledge above the 5.8 roof. From there, we climbed pretty much straight up the dihedrals for a full pitch. Then we traversed right. The traverse right was our pitch 6 and ended somewhere pretty close to where you show red 6. So there are at least two good ways to do the last couple of pitches. Red pitch 4 looks cool too. Thanks for posting! Regarding the descent, in August 2011, there were two existing rap stations off large flakes that required two 60m ropes (we had them, 8mm doubles). Both raps had fairly new, doubled webbings with rings. This worked well and seemed to be a much faster way than to downclimb roped the the notch. Suprisingly, no existing rap stations for a single rope, but (I guess) people just downclimb this. This is all very revealing. More interest in the area than I had suspected exists. It's a new season, Summer 2012. Snow's history. Or in the Camp 4 idiom of 45 years ago, "What a Trip Report, Tall Dude." Mt. Starr King ascensionists assure me the place cures Snake Dike Fever. Mouse: Ya' just can't believe everything ya' hear! I did Snake Dike AFTER I did my routes on Starr King! They're ALL GOOD THO! ENJOY! One of the coolest things I've found on supertopo yet. Thank you to everyone who has contributed to it, and thank you munge for leading me to it with your other thread! Time to generate this page: 0.22 secs.